We are committed to creating endless opportunities for families and individuals impacted by intellectual, developmental, and physical disabilities. 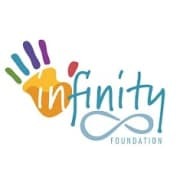 Infinity Foundation envisions a community that embraces those impacted by intellectual, developmental, and physical disabilities in daily life; a community where all people support each other to reach their highest quality of life possible. We provide financial assistance in three areas: program assistance that ensures quality year-round therapy and community services, emergency assistance for unexpected events that impede quality of life, and agency assistance to support those who provide high-quality services. Infinity functions on two distinct yet complimentary platforms - to raise money for those we serve and to distribute those funds to qualified applicants. In short, our two areas are in development and operations. Would you recommend INFINITY FOUNDATION?